Prior was -$51.1B. The prior month was unrevised. 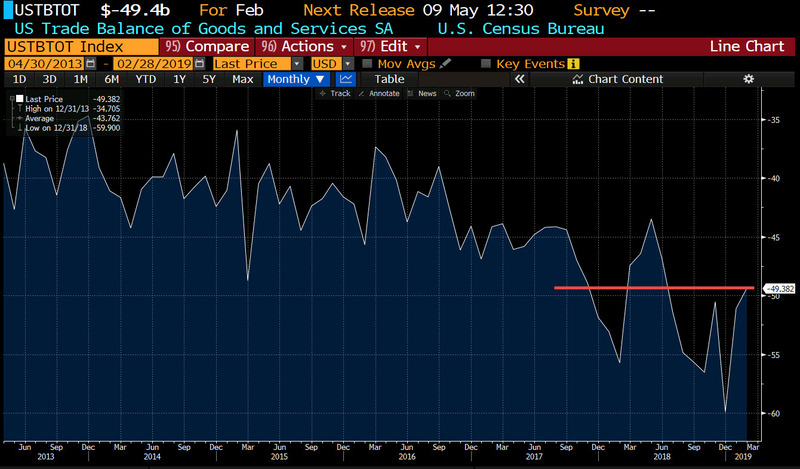 The report shows the smallest trade deficit since June 2018 and moving back in the right direction for the Trump administration. China deficit was smaller. Exports grew by 1.1% after rising 1.0% last month. Imports - which fell last month - rose modestly this month. Surplus in oil. Capital Economics notes that the deficit was narrowed on a jump in aircraft exports and slower import growth. "Neither of those are particularly compelling reasons to be upbeat about economic prospects this year, but the figures do at least confirm that net trade will provide a substantial positive contribution to first-quarter GDP growth, which we now think was 2.0% annualised," they write.